From the U.S. Fish and Wildlife Service's online digital media library. Check http://images.fws.gov/ for higher quality version. Abstract: Gumbo limbo, Jamaica caper, strangler fig, red mangrove and white and black), night-blooming cereus, sea grapes, and cabbage palms . . . the plants that vegetate Ding Darling Refuge evoke a sense of the exotic and mysterious. And the wildlife are equally exotic: West Indian manatees, American alligators, American crocodiles, wood storks, roseate spoonbills, sea turtles, frigatebirds, gulf fritillaries, horseshoe crabs, dowitchers, black-whiskered vireos, and brown pelicans. For more than 2,000 years, the Calusa Indians called this tropical paradise home. By the mid-1800s, Europeans had displaced the tribe and used the island mostly for agriculture. In 1926, a fierce hurricane destroyed the agriculture industry. 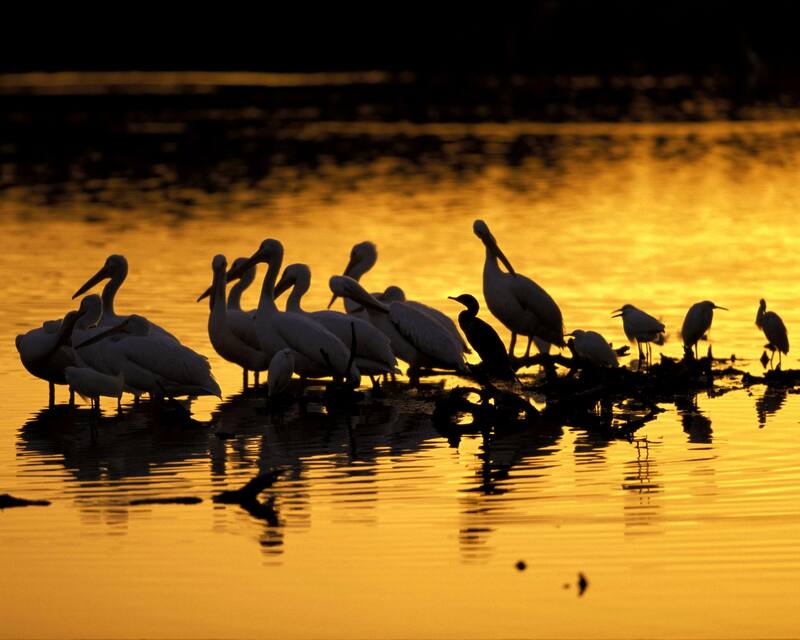 The refuge was established in 1945 as the "Sanibel National Wildlife Refuge." It was renamed in 1967 to honor pioneer conservationist/cartoonist/U.S. Biological Survey (later U.S. Fish and Wildlife Service) Director Jay Norwood "Ding" Darling. Ding Darling initiated the Federal Duck Stamp Program and designed the first Duck Stamp in 1934. Duck Stamps are required of all waterfowl hunters 16 and older. Revenues generated by Duck Stamp sales are used to buy wetlands to protect wildlife habitat. One of the best ways to see this barrier-island refuge off the southwest coast of Florida is by canoe. There are several canoe trails and canoes can be rented at the refuge. Auto-touring, hiking, fishing, and wildlife photography are also popular activities.